In the struggle for eternal youth, women forget about the most important thing: no matter how much cream is applied to the face, if the facial muscles, or the eyelids or forehead muscles, lose their elasticity over the years. To combat mimic wrinkles and maintain the muscles of the face in a tone, a yoga technique for the face was developed. It combines the traditional method of training the muscles of the face and neck with elements of classical yoga. Put some air in your mouth and form a ball from it. Move this ball under the right cheek, under the lower lip, under the left cheek, under the upper lip (clockwise and in the opposite direction). Stop for a couple of seconds. Repeat 5-6 times. Benefits: prophylaxis and correction of the sagging of the cheeks, smoothing of the wrinkles of the nasolabial triangle, correction of the line of the chin. 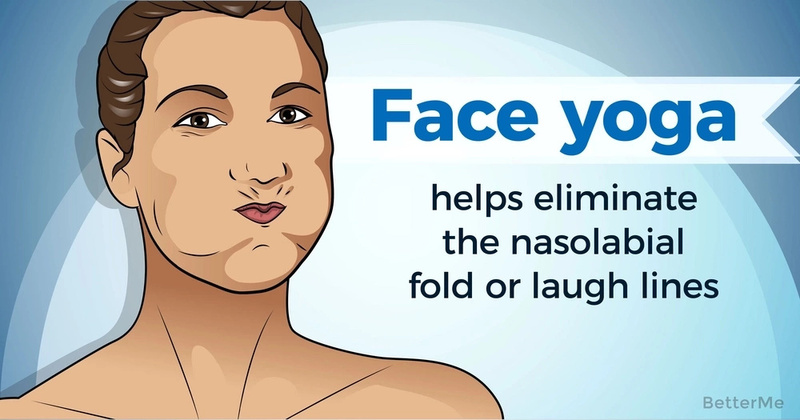 Pull your chin as far as you can and hold for a few seconds. Then pull it in and stop it too. Then move to the right, hold. Move left, and again stop. Quickly move the jaw to the left and right. Repeat the entire cycle 5-6 times. Benefits: improvement of the oval of the lower part of the face, the double chin is removed, the muscles of the neck and cheeks are strengthened. On exhalation tighten the muscles of the cheeks, clench your lips and teeth and stay in this position for several seconds. On inhaling, slowly relax your face. Repeat five times. Benefits: blood circulation of muscles is improved, the oval of the face is corrected, muscles are strengthened Performing special exercises in the yoga program for the face can resist the gravitational effects and age changes that the skin of the face undergoes over the years. The practice of yoga for the face requires emotional calmness and mental concentration. Otherwise, practice becomes a banal gymnastics for a person whose mechanical performance is not capable of profoundly affecting a person's mental state and giving him emotional liberation.